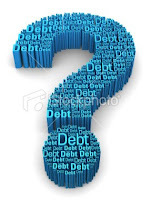 Should you invest in companies that carry large amounts of debt? That is a question every investor should ask when evaluating stocks. Unfortunately, the answer isn’t as easy as “yes or no.” The correct answer is “it depends.” The problem is that some industries typically require more debt than others do. For these industries, a higher debt load is normal. For example, utilities often borrow large sums of money when building new power plants. It may take several years to build the plant, which means no revenue and lots of debt. However, the useful life of power plants spans many years and when the debt on the plant is repaid the facility can become a real cash cow for the utility. For other industries, a large debt load may signal something seriously wrong. Of course, any company might pickup a big note if it just bought a building or a competitor. There are several tools you can use to determine whether a company is exposing itself to too much debt. The first is the Debt to Equity Ratio. This ratio tells you what portion of debt and equity is used to finance a company’s assets. The formula is: Total Liabilities / Shareholder Equity = Debt to Equity Ratio. A ratio of 1 or more indicates the company is using more debt than equity to finance assets. A high number (when compared to peers in the same industry) may mean the company is at risk in a market where interest rates are on the rise. If a company has debt, it has interest expenses. There is a metric called Interest Coverage that will give you a good idea if a company is having trouble paying the interest charges on its debt. The formula is: EBITDA / Interest Expense = Interest Coverage. EBITDA is Earnings Before Interest, Taxes, Depreciation and Amortization and measures the operating performance of a company before accounting conventions and non-operational charges (such as taxes and interest). The resulting ratio tells you whether a company is having trouble producing enough cash to meet its interest expense. A ratio of 1.5 or higher is where companies want to be. A lower ratio may indicate that the company has trouble covering interest expenses as well as other costs. Debt is not a bad thing when used responsibly. It can help businesses grow and expand. However, misuse of debt can result in a burden that drags down a company’s earnings. We know the demerits of investing in stocks like Suzlon & GMR which have an insatiable appetite for more and more capital. To feed their perennial hunger, these companies dilute their equity by making FPOs, GDRs & FCCBs resulting in total destruction of shareholders wealth. Companies should be lean and mean requiring minimal capital but generating huge returns there from. Do you really find it difficult to search for companies with strong fundamentals? Nothing to worry about, simply subscribe to Hidden Gems & Value Picks and start investing systematically in small and mid cap companies with great businesses to create wealth in long term. Avail attractive discounts by subscribing to our combo packs, click here for details.